A staffer drafted a statement of condolence for President Trump to issue on Oct. 5 — the day four U.S. soldiers were killed in an ambush in Niger — but Trump never delivered the remarks, Politico reports. At a Monday press conference, nearly two weeks after the ambush and the drafting of the statement, Trump fielded criticism about his silence in light of the soldiers' deaths. He responded with the false claim that past presidents, including Obama, never called the families of soldiers killed in action. Tuesday, Press Secretary Sarah Sanders said Trump called all four families to offer condolences. But the White House found itself embroiled in another controversy as Rep. Frederica Wilson called the president "a sick man" for telling one widow her husband "knew what he signed up for." Trump denied that he said those words, but Sanders did not. 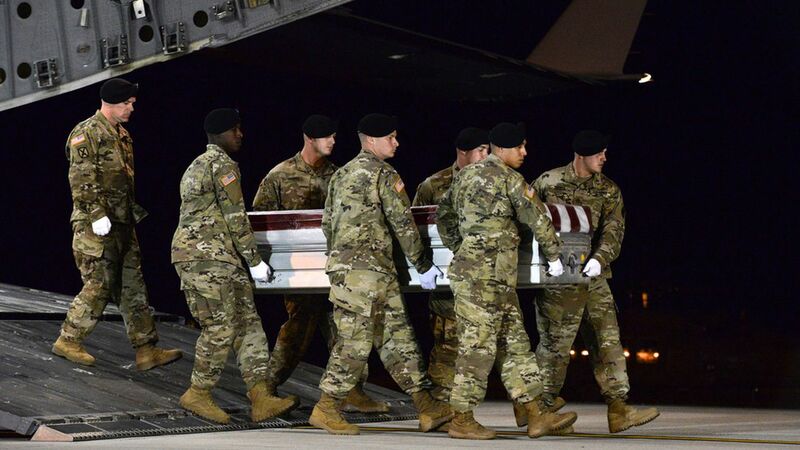 "Melania and I are heartbroken at the news that three U.S. service members were killed in Niger on October 4 while providing guidance and assistance to Nigerien security force counter-terror operations. We offer our deepest condolences to the families and friends of these brave American soldiers and patriots. They will remain in our thoughts and prayers. We are also praying for the two U.S. service members who were injured in the incident. We wish them a complete and swift recovery. The heroic Americans who lost their lives yesterday did so defending our freedom and fighting violent extremism in Niger. Our administration and our entire nation are deeply grateful for their sacrifice, for their service, and for their patriotism."